Kind words: STOP CRUSH.ORG posted: "thank you, Thomas, for the interview for Stopcrush.org, you did a beautiful job bringing out the finest points, you did the cause a great service! sharing all over! XO"
WILD TIME talked to Marla Stormwolf - Patty and Anthony Damiano about their campaign to bring an end to the vile reality of crush videos. 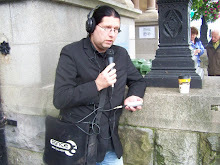 Indymedia.ie provides FREE space for "alternative" media such as WILD TIME and many others. Now they're asking for donations to keep the site alive - please help if you can? ... is a two part interview recorded by WILD TIME. WILD TIME's Thomas Janak talks to Seraphime Angelis about animal communication on a soul-to-soul level. This piece offers an insight and exchange of thoughts and techniques regarding communication with animals and also deals with the interaction of different species. * - sometimes Indymedia.ie combines more-part footage into one story, in which case link number two becomes unnecessary. Sorry about that, I really am especially because this is a very important topic and both Marla and Anthony are very passionate activists. Well, here's to technology, eh?! A 45-minute interview with Marla Stormwolf - Patty and Anthony Damiano from StopCrush.org just ended and will be edited and uploaded tomorrow at the latest.